I use this dressing a lot; it serves as a sauce, a dressing and equally well as a marinade. I love it with fish, roast chicken, over asparagus and I have even tossed it through some pasta. 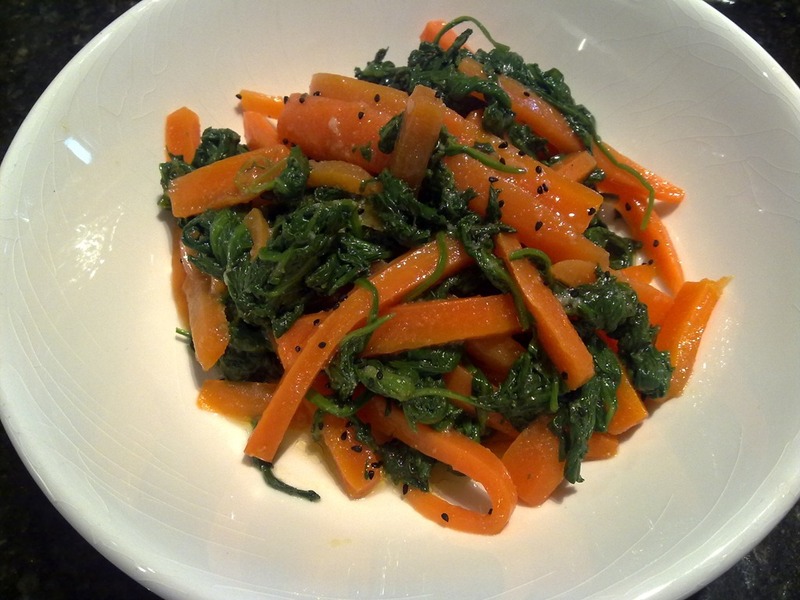 With autumn flapping around our heals it is a good time to increase the intake of Vitamin C. This dressing goes a long way toward ensuring I do and becomes a firm staple in my kitchen throughout the winter season. The dressing keeps well for about a week in the fridge. Combine 70 ml lukewarm water and half the olive oil in a small saucepan. Whisk in the lemon juice, parsley, garlic and oregano; Season to taste. Next, heat all the ingredients over low heat for about 5 minutes, stirring gently and often; after about 5 minutes add the rest of the oil and combine until emulsified. Place in a jar with a screw top lid and store in the fridge. Shake before use. To change the flavour, you can add some of the following ingredients if you choose. Chilli fresh or dried, finely chopped sage, finely chopped mint, finely chopped basil, or finely chopped anchovy. Steel grey in colour the choppy waves capped with white foam, heave and churn wildly below my garden deck, it is as always quite an awesome site. It’s raining too and I am pleased that I shopped for food yesterday. Tomatoes cut in half lightly drizzled with olive oil, topped with a smidge of Demerara sugar, a light sprinkle of Greek oregano and salt and pepper, are roasting off in the oven. It should take about an hour and half at 180C to reduce them to a concentrated richness. When done I put them in a pot, add some chicken stock, correct the seasoning and simmer for about 5 minutes then blend the lot together. Sometimes I will strain the soup, most times I prefer not to. By roasting the tomatoes you get a rich unctuous creamy textured soup yet it has no cream, served with some crusty homemade bread and a good bottle of wine it makes a perfect light dinner or a starter. 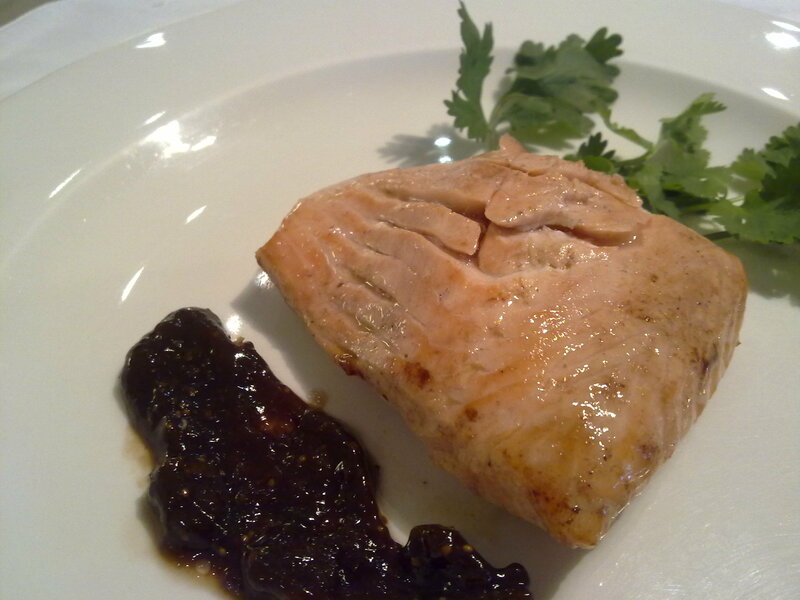 But for lunch; a nice piece of fresh farmed salmon seasoned and gently poached in about two table spoons of the fat, skimmed off the top of the stock from last night’s coq au vin, it adds another layer of subtle flavour. 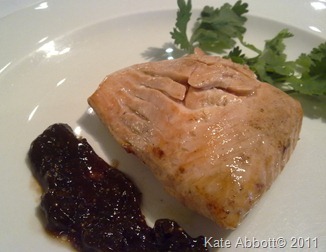 I serve the salmon with some fig and raisin chutney which compliments the fish beautifully.